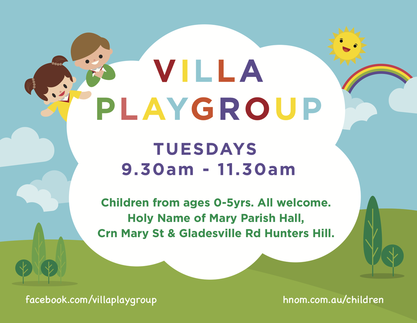 Playgroup is held in the Parish Hall, which is on the corner of Gladesville Rd and Mary St in Hunters Hill. The Parish Hall is a very large safe space for little ones to burn off some energy. We have an art and craft table, cafe corner, construction toys, a teepee, bikes and the list goes on and on! Activities are rotated on a weekly basis to keep things interesting and motivating. Now to the best bit…the adults have a chat, and a cup of tea and bickie. You will meet fantastic new people from our amazing local community - chances are, you will meet someone that you will know for a very long time as your kiddies head to preschool or school together. A gold coin donation is appreciated with each visit and bring along our own child's food. All are welcome whether your visits are frequent or infrequent. The more little smiling faces there the better! To see the photo evidence of our fun and for all the latest information and updates like our Facebook page.